Editor’s Note: Mike Ciul needed to order some checks. He decided to make a statement by having them printed with his own background designs. I’ve seen the checks made from the watercolor design; they are beautiful. Click on the picture for a high-res version. 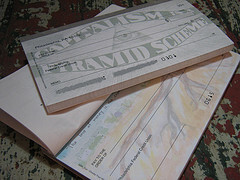 As far as I know, there is only one company that will print your design on a check. That company is Checks Your Way. If you make checks from these designs, please send an email to captainmikee at yahoo dot com to let me know. Thank you! 26 Comments Leave a comment. What political group are you in? Its hard to find anyone thats a Christian and is against capitalism. The check designer is a Catholic convert. I\’m a registered Green but I\’ve stopped voting. I\’m interested in the Catholic Worker idea, but I\’m not a Catholic Worker. I know a lot of Christians who are against capitalism – some of us consider capitalism to be a betrayal of Christian values. Just to put in a voice of dissent here, I’m a Christian and I don’t dislike capitalism. Or, at least, I like other economic systems even less. What is that saying about democracy, that it’s the worst of all possible systems, except for all of the others? I think alternative systems in which food, goods, etc. are all provided equally are only applicable to very small societies with limited resources, probably a closed system, etc. Maybe a few hundred people, max. The problem is that eventually somebody’s needs are going to be different, somebody’s going to have a different opinion about the best way to go, somebody’s going to want to set out on their own, situations are going to change, etc., and there’ll be conflict in the system, and systems predicated on unanimity can’t handle those conflicts. Capitalism is at least predicated on everybody being able to make their own decisions, and most people prefer that freedom to being told what to do by society. The problem, of course, is that in a competitive system some people end up with very little. That’s why capitalism is a good start but shouldn’t be held dogmatically. There is plenty of room within a democratic, capitalist system for checks on the power of the wealthy so that they don’t run roughshod over the poor, and safety nets for the poor, both public and private. There are still going to be some wealthy people and some poor people, but there can be ways to help the poor lift themselves out of poverty, or to care for those who absolutely can’t help themselves. Some of that is in place in this country, but we need more. As the Church has said, we need to not see people through materialistic, utilitarian eyes. But *if* the poor are taken care of, then for the rest of society capitalism provides a mechanism for sorting out concepts and an efficient distribution of goods. Instead of someone else deciding for you how much food you get, what sort of a house you live in, what sort of a job you work at, etc., you get to set your own priorities and make your own choices within your means. Again, there are all sorts of corrections to be made for the ways in which capitalism fails to provide for the poor or fails to provide for efficient change, or may not be fair in some ways. But a society’s wealth grows overall under capitalism, and if it’s a system open to participation by many (capitalism in North America vs. capitalism in South America), it can lead to an overall improvement in living standards for many people. Communism, anarchy, etc., on the other hand, condemn entire societies to stagnation. Capitalism and Democracy are not synonomous. Democracy thrives without capitalism. The way things are now capitalism gives corporations more power than the people , thats not democracy. Capitalism can never be equal, people born poor will never have the same opportunities to enjoy life that the rich will have. Capitalism creates greed and this is why we have third world countries with every 7 and 8 year old girls working 12 hour days in sweatshops for 50 cents. Where if workers try and unionize they are killed by corporations like coca cola’s military police, all to keep a low over head. Cut throat, more than me before you ,it’s my 50 inch plasma before your groceries… that’s capitalism. No, they’re not synonymous, but they do correlate well. Greedy people thrive under capitalism, but greed itself has been around as long as people have been. There is both a good side and a bad side to capitalism. One way to characterize it would be the “participatory” aspect and the “exploitative” aspect. We can create regulations that curb the exploitative side of capitalism while allowing the participation, innovation, mobility, and growth that can come with it. This statement does not fit well in the biblical ground motive (â€œgrand narrativeâ€) of Creationâ€“Fallâ€“Redemption: â€œgreed itself has been around as long as people have beenâ€. Recall that greed is traditionally considered one of the seven deadly sins. If greed is a sin, it cannot be the radix of an arrangement where things are put in their right relationships (â€œshalomâ€) with one another. Did not SaintÂ Paul get it right at 1Â Timothy 6:10? 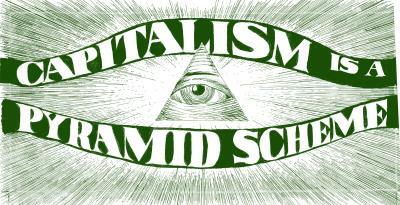 Capitalism is the exact opposite of a pyramid scheme. A pyramid scheme involves one party at the top of the pyramid where all the money & resources eventually end up. Capitalism is actually a broad network of corporations & individuals trading goods, services and money to each other in exchange for other goods, services, or money. Socialism, on the hand, IS a pyramid scheme. Where The Goverment sits at the top of the pyramid, funneling all the money its way. Some would say that capitalism as practiced often ends up in oligarchy, in which a relatively small group controls the system and funnels the money to the top. Seems to me that the key point is the visual pun. Plus, it’s snarky to have designs critical of the prevailing economic system on your checks. If you have a fun, clever design for a pro-capitalism check, please send it in. Can moral values and ethics replace greedâ€¦? â€œRegulated Capitalismâ€¦â€ What an innovated concept. Many people and corporations do operate morally and/or ethically under capitalism. Any time you choose to support or not support a business for a moral or ethical reason, then you are acting based on morality and ethics rather than greed. There is a wide spectrum of how corporations treat their workers; many corporations have found that it is good for business to treat their workers, customers, greater communities, and the environment with respect. Others have not. Governments can set incentives, penalties, or markets that enhance this effect, such as how charitable contributions can be written off of taxes. I was at a meeting on green building practices recently between planners for the City of Los Angeles and private companies; the representatives of private companies were asking the city government to set up a system of requirements and incentives to make more environmentally sound building practices better business. It’s a valid point to say that when it’s profitable for a company to behave responsibly then the company couldn’t be said to truly be acting out of morals and ethics. But the regulatory structures that have been set up can be a way of building morals and ethics into the system, and as the example of the green building meeting shows, these structures can come into place with the full cooperation of the business world. The business representatives at that meeting wanted to do the right thing, but they didn’t want their businesses to fail for doing so. Regulated capitalism isn’t really an innovative concept; regulations to capitalism have been around in some form for centuries and began to become more powerful (8-hour days, no child labor, etc.) about a century ago. There are still many abuses of workers in the world, especially as companies move factories to countries without a tradition of capitalism that has formed a healthy middle class. We must work to build many of the same regulations on capitalism that have improved the lives of workers in industrialized countries to poorer countries to improve the lot of workers there, as well. Yeah, sorry for actually, you know, discussing things. I am Catholic, and I see capitalism as the only way out for the world poverty. It is also the economic system approved by the Vatican. It is the ONLY system that truly respects the human being per se and its fundamental rights. What\’s the best ally of Capitalism? Organized religions that promote lots of babies. Does Capitalism really care about the human being? No. That\’s democracy. Don\’t get them confused. Democracy does not thrive on profitability. It does not address profitability. It is a model for majority representation with good or bad outcomes. It is interesting to note that certain financial and governmental models may be appropriate for growing populations, but may hit thresholds when they are no longer appropriate due to physical constraints such as the depletion of natural resources. Our scientist and top governmental officials are aware of the potential breakdown of the capitalistic model when resources become scarce. That is why you see the increased interest in space exploration – to seek sources of natural resources in order to keep the model from breaking. Actually, I would clarify: Democracy ostensibly is supposed to represent the human being. In real terms, it is better to think of Democracy as an American Idol rerun. In short, it is a contest among the photogenic and popularites. It has been the case for many decades that the United States has ignored basic health needs of vast segments of its population in the lower and prison classes, for example, and these people do not “count” in our democracy. Legally, felons are prevented from voting. But more importantly, poor people in general are pushed out of the political process in a number of ways. So, I would say Democracy is a mirror and we’re getting what we deserve. About capitalism and natural resources — this holds true only as long as we’re strictly talking about a manufacturing-based economy. As our economy moves more toward service and information industries, a growing economy doesn’t necessarily have to rely on increased depletion of natural resources. Even within a manufacturing economy, there can be value added through higher-quality workmanship or other ways that do not involve consumption of more resources. Also, as countries industrialize, environmental protection laws are also generally (though not, of course, universally) stronger in more prosperous nations. In essence economies grow by first providing necessities, then by providing luxuries, and eventually people whose needs are being met can, essentially, trade some economic liberties for the value inherent in clean air, open space, etc. A completely pre-industrial country would generally deplete even fewer resources, of course, but industrialization is a genie that we cannot put back into its bottle. No, Adam. The economies of this planet cannot expand much more without depletion of natural resources. Eventually, quaternary (financial), tertiary (services), and secondary (manufacturing) industries have to rely on primary production, namely agriculture. Maquiladora workers in Guangdong, Wal-Mart associates in Chicago, and stock-market analysts in the City of London all need to eat. Humanity hit jackpot with fossil fuels and Haber-Bosch last century, so advanced economies such as the European Union can go on with a ridiculously low 7 % of the population engaged in agriculture. But I am not naive/optimistic enough to expect to hit another jackpot like this anytime soon. With the need to reduce greenhouse gases and peak oil, we will either need to scale back somehow and re-engage in agriculture with a larger fraction of the population, or accept even more drastic global inequality than it is now. On either end of the 19th/20th-century wonder: Jean-Jacques Rousseau already worked this out in his draft constitution for Corsica. And recently scholars in China such as Chen Guidi and Wu Chuntao have rediscovered that China’s recent economic growth is still built on the back of overworked and under-rewarded peasants: no surprise, really. Meditate on this mystery the next time you go to Mass. I would agree that capitalism is a system that requires a growing population. I read a couple of books lately that shed light on why this is our current system. Interestingly, they both trace it back to the end of the ice age 10,000 years ago. At the time, the environment could only support a small number of very tough, feral creatures of the hominid, ruminant, canine, rodent, etc. variety. A tough animal lives a long time and produces a few offspring every year. As the glaciers receded, space was made for a huge expansion in population. Something interesting happens in terms of evolution in this case. There is a mechanism for rapid genetic adaptation one author calls “neoteny.” Basically this means animals retain more of their juvenile traits into adulthood. The result: civilized humans and tame animals. Tame animals live a short time but produce many offspring in their youth — an excellent means for rapid population growth. And yes, religions encouraging procreation have the same environmental root as agricultural societies — the story of the flood in Genesis, for example, relates to the frequent floods of Mesopotamia that destroyed forests and allowed grains to grow in large areas of land. By simulating flooding with irrigation, humans were able to conquer the forest. As we approach the limits of the new habitat that the end of the ice age provided, we may have to return to the former “feral” model of living. I’m not suggesting putting the genie back in the bottle — I suspect there is a way to go forwards instead of backwards — but often the new incorporates elements of the old, and we would do well to remember our origins. All I have to say is that I like the “Capitalism is a Pyramid Scheme” tag. Even if it may not be true in the absolutely sense, it has some ring of truth to it by the (ill)nature of most it’s participants. All though the points above are great (Capitalism is Cannibalism), i think the pyramid refers to the all seeing eye/new world order aspects of the current system. (A) I’m not a christian, but reading this is really inspiring, there’s actually lots of anti-capitalist christian groups, such as the christian Anarchists etc. This system turns people against each other. I can only think of one off hand, Jesus. You may have heard of him, he’s the son of God. I’m sure there are others. Well, that was a bit snarky, but true enough in my view. Whether it’s hard to find present-day Christians who aren’t the son of God and are against capitalism, I think it depends where you’re looking. Mercedes said: “[Capitalism] is also the economic system approved by the Vatican”. Can someone provide a citation for this please?